When I refer to “combine,” I’m not talking about bolting together solutions from multiple vendors running on multiple instances of different databases or clouds. 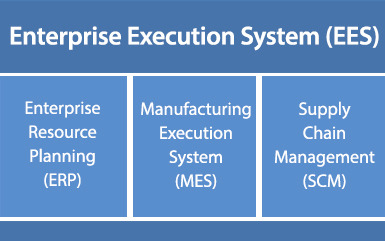 I’m talking about EnterpriseIQ, which is a true Enterprise Execution System that provides reliable, integrated functionality of both ERP and MES software on a single database. EnterpriseIQ by IQMS is a dynamic information and control system that drives effective execution of enterprise activities for financial, supply chain and manufacturing operations. The problem solving advantages of a single system that provides the totality of functionality for the manufacturing enterprise are many. The data integration alone is worth the price of admission. Traditional ERP and MES solutions have overlapping functionality particularly when the ERP vendor has attempted to reach down to the MES level of the ISA-95 model to try to offer a more end-to-end solution. These ERP vendors never seem to go the rest of the way and offer true real-time connectivity to the machines in the work centers. The real-time connectivity to the machines on the shop floor is the cornerstone of MES software for good reason. IQMS started developing real-time machine connectivity in 1993 as a way to solve our customers' production control problems. This development proved so effective at providing OEE information that we expanded the connectivity to include PLC and discrete sensor data collected directly into our data historian and SPC module, where applicable. The real-time data is used by many other execution modules such as automated production reporting, advanced planning and scheduling, capable to promise, quality control and preventative maintenance. Following production in real-time allows the advanced planning and scheduling function to make decisions about when and where to run individual items based on where they run the best. The automated real-time production reporting not only reduces labor but provides visibility of overall plant or specific work center performance to analyze production as it occurs. The instantaneous feedback of critical parameters, total part counts, downtime and rejects reduces the likelihood of overruns, which is the bane of lean manufacturing. Light sticks mounted at the work centers show the operators and technicians exactly how the process is running. If the light is green, they know they are running lean! The finite schedule is updated with every production cycle, allowing the capable to promise (CTP) calculations to incorporate the information in order to provide the most intelligent availability predictions. Customer service representatives use the CTP function to provide up-to-the-minute information to both internal and external customers. Gathering real-time process data at the PLC or discrete sensor level allows unlimited process parameters to be captured, viewed and analyzed as the parts are being produced. SPC ASQ run rules can automatically be applied in the SPC module to view process trends and control processes before they exceed specification limits. Alert notifications, including visual, text notifications or even audio plant-wide announcements, can be sent to keep manufacturers proactive and informed. The IP-based process monitoring framework also allows for supervisory control of downstream equipment such as conveyors, pallet wrappers and even robots. Manufacturing EES provided on a single database by IQMS is inherently more powerful and cost effective than cobbled together, so-called "best of breed" solutions. Just ask our customers.